DD.COM is a floppy imaging program for CP/M. It is modelled after the UNIX utility dd. It allows one to make a floppy disk image from an H8D file or to dump the floppy disk to an H8D image. dd currently only works for reading and writing H8D CP/M disk images to and from an H17, 100k, hard sector diskette drive. dd – Prints out the help. 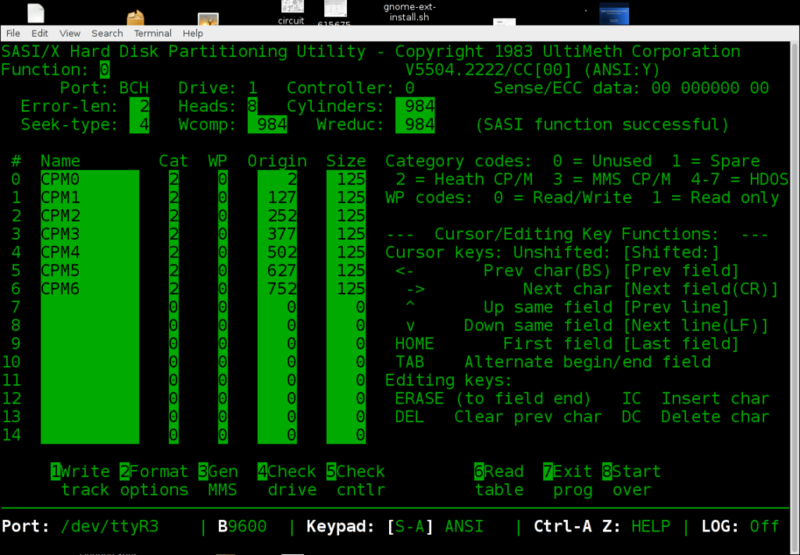 dd map – Prints a map of your disk drives – must have floppy inserted. dd if=<file|drive|port> of=<drive|file|port> – copies images. dd if=ttys1: of=d: – Images D: drive from serial port using h8clxfer or H89LDR9. You can download the BDS C source code and the compiled, ready to run versions of DD.COM here. – Dig drive letter out of filename so it uses the the correct drive when doing a bisoh(SELDSK). – Add version and date to help. – Add drive type to map display. – Added serial port support which can be used with Dwight’s H89LDR program or h8trans/h8clxfer. Error checking is a little weak yet but I’m working on it, for example, it fails if a diskette isn’t inserted in the drive. The program is written in BDS C so it is easy to extend. I will be adding the ability to work with H89LDR so one can use the serial port from a PC as well. Just remember you MUST have a formatted floppy inserted in the drive before you copy.